Rock Gate is just that.. Rocks and Gates. The architect named it. What if I show you a mathematical relationship between the 3 known "gates" and the 1 hidden South Gate? About as simple as it gets really. The square layout of the south wall is SW to SE corner..and the East wall goes from SE corner to the NE corner of the Saturn Stone. Then you simply take that square and divide each side by the golden mean. 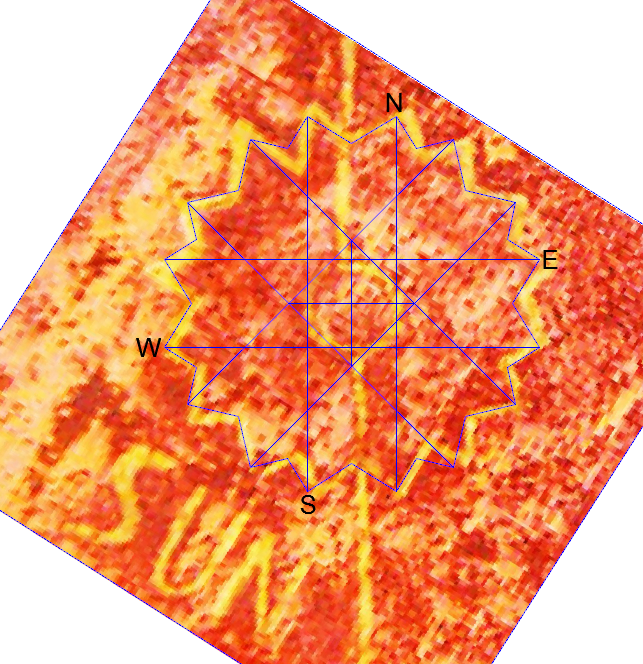 You see that the north horizontal line aligns with south edge of the East gate and the south horizontal line aligns with the south edge of the West Gate. The east vertical aligns with the West edge of the North slit or "gate". This leaves out only the South Gate. As it happens, years ago, I had a dream/vision at Rock Gate and was shown an underground South Gate at this location. It was carved in an archway under the south wall. It was fed by a creek of water flowing north from a spring to the south of the quarry by today's visitor's center. The flow of the water I noted was flowing North. 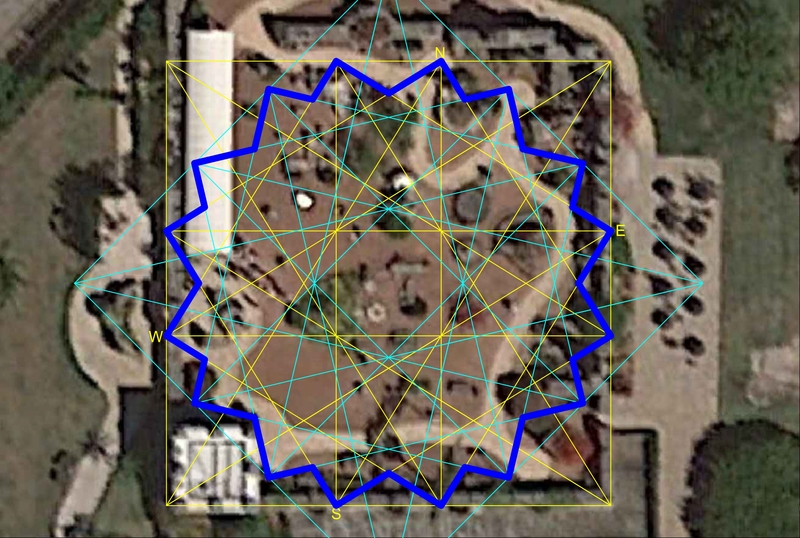 If this layout I've presented from Google Earth measures to be true.. then it would be further undeniable FACT that Edward Leedskalnin was into the Golden Mean and "sacred geometry". Unless of course, he did not design the layout of Rock Gate. Is it a coincidence that this square and associated cross diagonals that reveal the centers of each built-in golden spiral of the various golden rectangles.. accounts for 8 or half of the 16 points of the 16-pointed star on the North and West Gates? 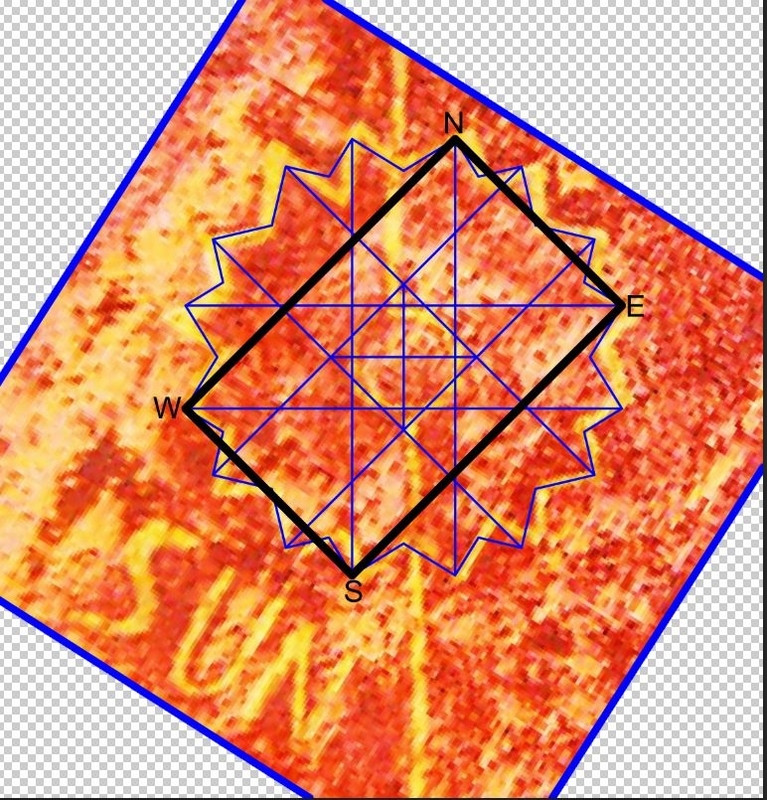 This shows the photoshop overlay of my AutoCAD construction of the 16 pointed star constructed with the golden mean and EDL's drawing on the Iron Door. Note that the golden mean or PHI is most commonly associated with the 5 pointed star. It seems to me that EDL used it also to construct a 16 pointed star. 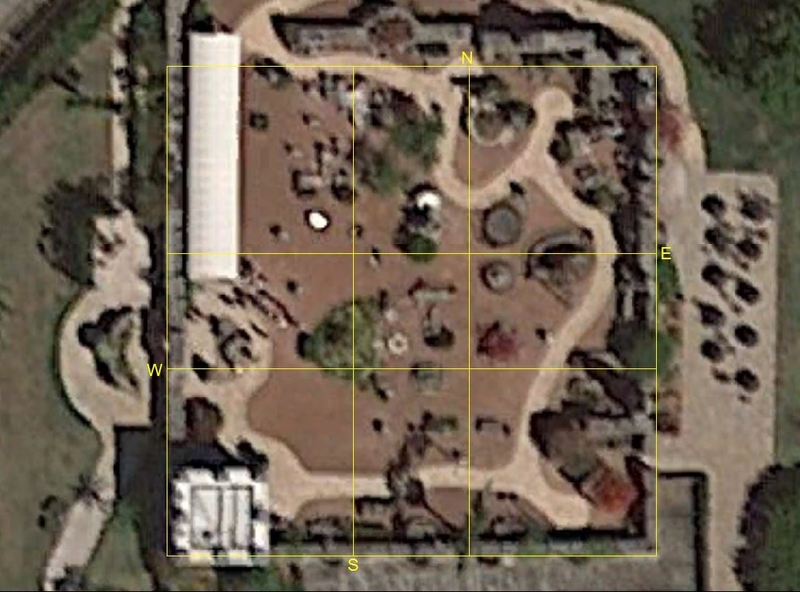 This is identified by his gate locations. 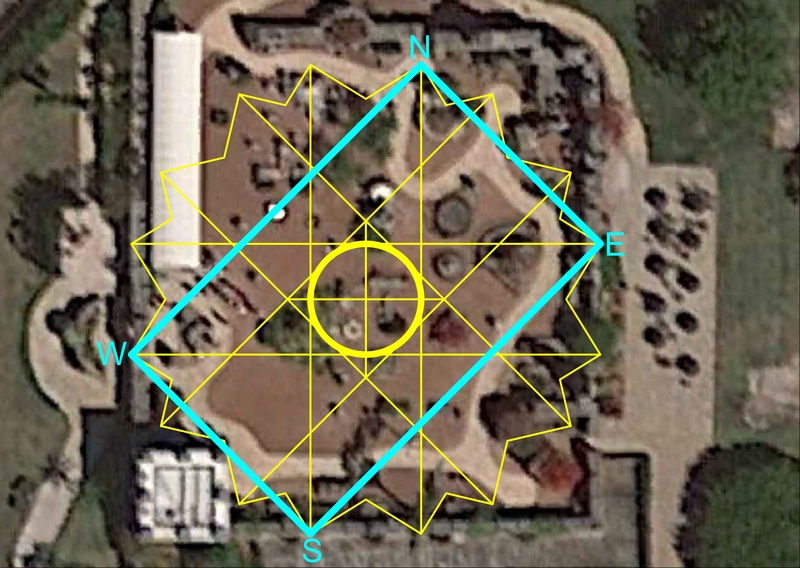 Notice that EDL's circle in the center of his "SUN" perfectly fits inside the center square of EDL's ROCK GATE square divided by PHI. If this isn't irrefutable proof then what is. Who else has shown the PHI relationship of EDL's whole layout and his pictures .. all dealing with PHI. I showed the same thing with his copyright logo in ABIEH. 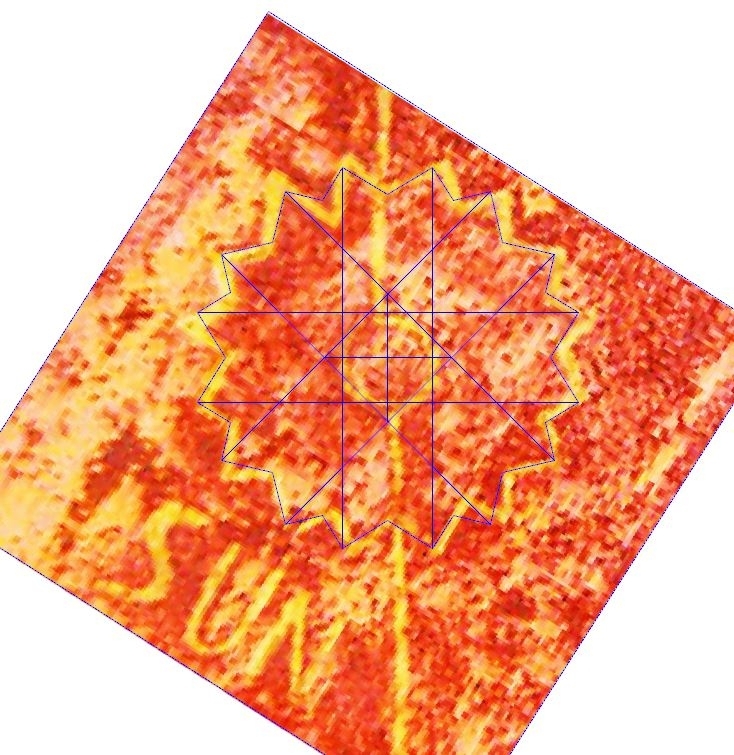 Here is another view of just the SUN image photo and CAD analysis construction. 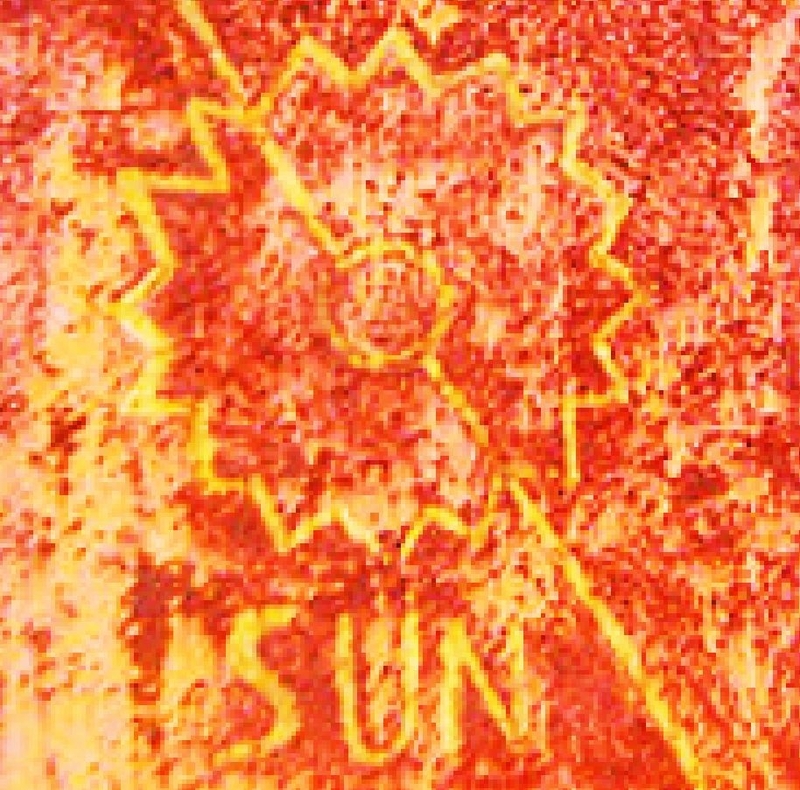 Anyone ever even wonder why the middle circle was there in the center of the SUN.. let alone why it was the relative size it is/was? That's one huge Sunspot. This shows the location of the 3 obvious gates and 1 hidden south gate. 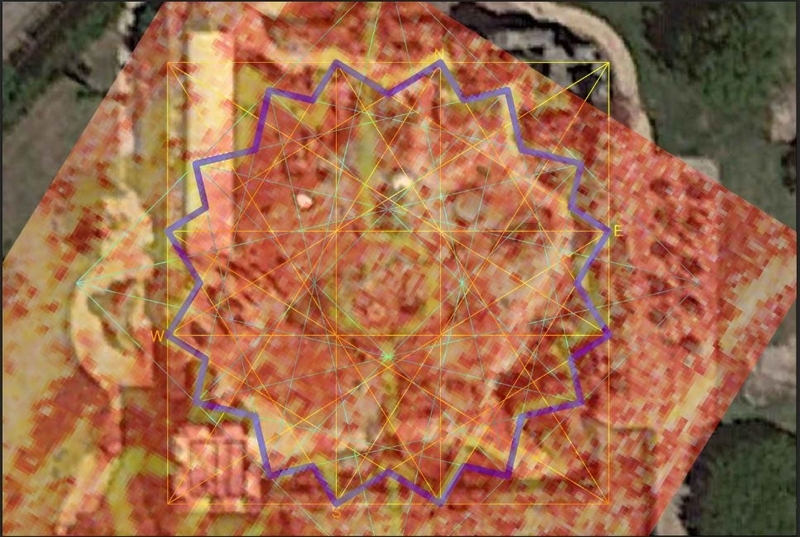 This shows the 4 gates are connected together by a golden rectangle of about 651inches wide by 1054 inches long. 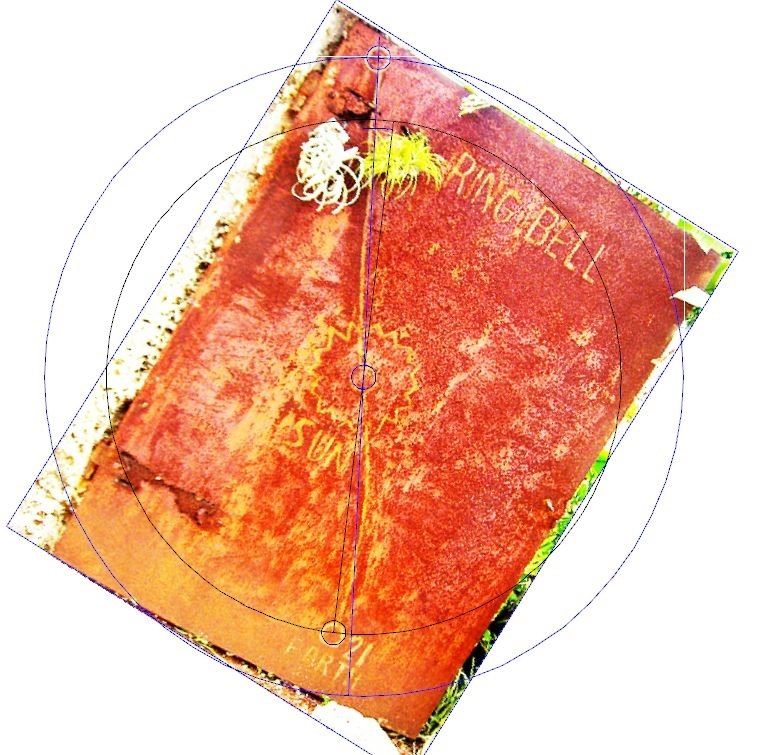 "RING BELL TWICE"..... or BEL maybe..
obviously "BEL" or "BAAL" but couldn't find link with that and sun..
Belenus (also Belenos, Belinus, Bel, Beli Mawr) is a sun god from Celtic Mythology and, in the third century, the patron deity of the Italian city of Aquileia. Called the "Fair Shining One" (or "The Shining God"), he was one of the most ancient and most-widely worshiped Celtic deities and is associated with the ancient fire festival and modern Sabbat Beltane. He was associated with the horse (as shown by the clay horse figurine offerings at Belenos' Sainte-Sabine shrine in Burgundy) and also the wheel. Perhaps like Apollo—with whom he became identified in the Augustan History—Belenos was thought to ride the sun across the sky in a horse-drawn chariot. This pic represents what I know about geometry on that door..and why I asked Matt if his cover image of EDL's curves reflects this geometry. Obviously, I'm looking at ALL the clues on the West Iron gate and North Gate because I firmly believe I've found the 16 pointed star in EDL's ROCK GATES. 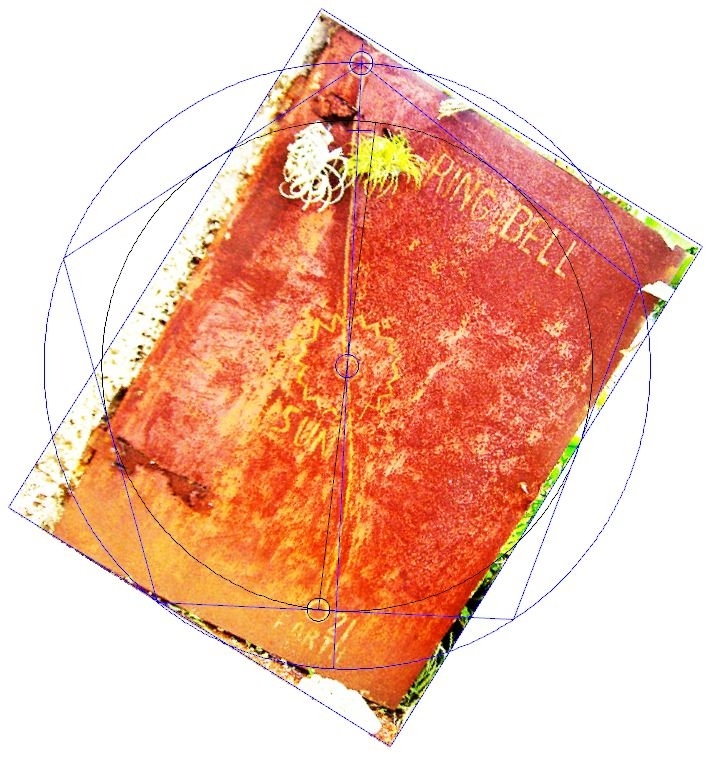 If true.. then the 3 circles on the door and their associated geometry have to mean something... other than the obvious Analema. I've already in the past used Starry Night software to plot the sun in the sky at noon every day for year 1936..and found this door is mirrored to the sun's path. And this pic shows the 5 pointed star or pentagonal relationship of the 2 circles. You see the inner circle is INSCRIBED in the pentagon..and the outer circle is CIRCUMSCRIBED about the pentagon. 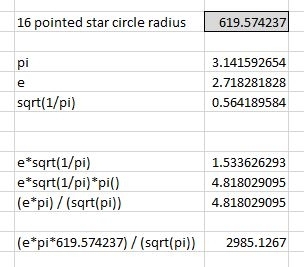 I noted earlier how the PHI or Golden Mean is usually associated with a 5 pointed star...and here we see it... and we also have the 16 pointed star that I have shown is associated with PHI as well. It's a match. Obviously, since the 1 circle at the bottom mentions "EARTH" one thinks about the pentagonal relationship of the orbit of Earth and Venus. ..but this relationship is involved with time in orbits and not in distance as is represented here. I just was looking online and happened to see first time the book by Michael Kohler that involves similar things as above with PHI and Rock Gate. I've been working on this topic for many years before him and I believe that what I've shared above is a much better basis for meaning of the 16 pointed star than what he has shared. He's on the right idea.. but not yet complete. I've found many more such things in EDL's works then even I've shared here or found in his book.